The main screen give you access to all of the features and settings. To display this screen either select Healthy Hints from Windows Start or click the program's notification icon. Closing the window will leave Healthy Hints running in the background to offer its hints. To stop the program from running, right-click the program's notification icon and select 'Exit'. 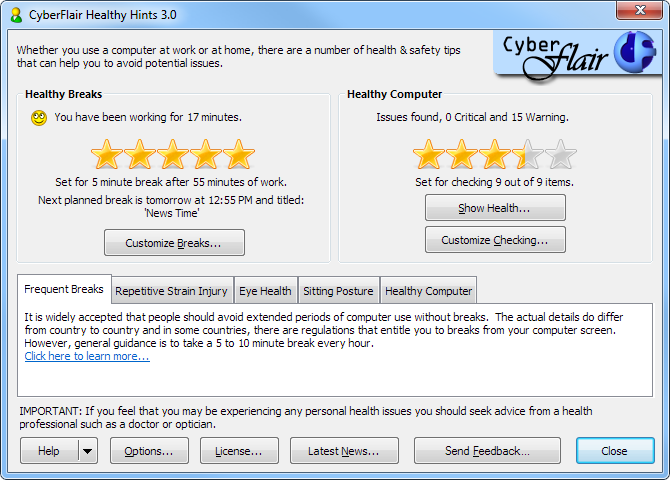 This shows your current settings for taking healthy frequent breaks and your current achievement rating for adhering to your settings of CyberFlair Healthy Hints. To change these settings, click the 'Customize...' button. » Click here for more information on Healthy Breaks. This shows a summary of any computer related health issues found along with a 5-star achievement rating. To display an up-to-date summary of your computer's health, click the 'Show Health...' button and to change which topics of your computer's health are monitored, click the 'Customize Settings...' button. » Click here for more information on Healthy Computer. This section offers additional information on factors that can have an impact on your general wellbeing as a computer user. Installations using a commercial license can also choose to insert details about their organization's health & safety information. See Options for details.